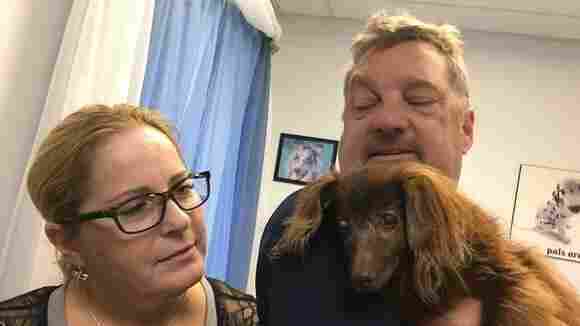 After 5 Years On The Lam, Lady Reunites With Amazed Owners There is no word if Lady was with Tramp, but a Connecticut couple was overjoyed to welcome the dachshund back home after assuming she had died years ago. Michelle and Rick Riendeau reunite with Lady, their dachshund who had been missing for five years. It's a happy and unlikely twist of fate because Lady had been missing for some five years, her overjoyed owners Rick and Michelle Riendeau told The Norwich Bulletin in a tearful video interview an hour after reuniting with her Monday at Norwich Animal Control in Mohegan Park, Conn.
Last Thursday, Norwich's Assistant Animal Control Officer Donna Gremminger happened to spot Lady in a Mohegan Park parking lot, the Bulletin reports, and she brought her to the pound. It took a little time because the phone number attached to the microchip was for a former employer in Rhode Island, but by Monday, the Riendeaus learned that Lady was at the pound not 20 miles away. "We live in a wooded area, we thought wolves," owner Rick Riendeau told the Bulletin about why they thought they would never see Lady again. "Or, she was 12, and we thought that was her way of going in the woods and ah ..." he trailed off as he choked up, seemingly overcome by the fact that Lady was in his arms after five years. How Lady survived for so long away from home — and just what she did for food and shelter — may forever remain a mystery. But the Riendeaus are just grateful to have her back. They said Lady was especially beloved by Michelle's grandfather, who lived with them. "She alerted us once when he had fell," Michelle Riendeau said. "She kept coming upstairs and running back and forth like crazy, and we were like, 'What is your problem?' "
Rick Riendeau continued, "And she brought me downstairs and he was on the floor." Lady had been with the family since she was just a puppy. "We got this dog when our kids were about seven and five," Rick Riendeau told the newspaper. "They're in their 20s now and they have kids of their own." He told the Bulletin he is now looking forward to Lady meeting the grandkids.